Alcohol And Seizures: Can Drinking Cause Epilepsy Or Convulsions? Although the consumption of alcoholic beverages in moderate amounts has shown no correlation with an increase or indeed onset of seizures, it is widely proven that over-use of intoxicating drink can lead to alcohol seizures. There is also proof that if a person drinks heavily and on a regular basis and then attempts to stop using it without any help, this can cause alcohol tremors. This article will look at the risks regarding seizures from alcohol. Learn about the epilepsy alcohol interactions as well as seizures from alcohol withdrawal. How can alcohol provoke seizures? How to help a person with alcohol seizures? Is it safe to drink alcohol if one has epilepsy? 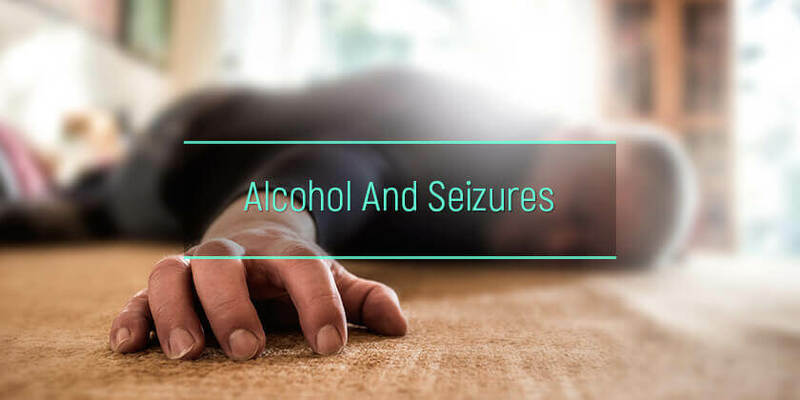 For those that may already be suffering from the emotional effects of alcohol, it will be important to know more about the alcoholic seizures. Seizures are what happens when there is a problem in the brain resulting in excess of electrical activity. This can sometimes be one of the symptoms seen in patients who drink heavily. As mentioned above, the general and moderate consumption of spirits has not been shown to result in alcohol-related seizures. Most cases where patients are seen to suffer an alcohol-induced seizure are due to massive over-use such as binge drinking. Convulsions can be brought on by either drinking heavily or withdrawal from heavy drinking. The various things that connect alcoholism and seizures all have to do with the way that the brain and body function. When a person consumes intoxicating drinks outside moderate amounts, there is a change in the way that the neurotransmitters are both absorbed and released by the brain. This change in smaller amounts can lead to the person feeling relaxed. This is because the neurons are not able to fire as rapidly once the drink is introduced to the system. In larger doses though, there is an increased risk that there will be a chemical imbalance which leads to an alcohol seizure. Here are some of the interactions to do with alcohol and seizures. Whenever ethanol is consumed, it causes a drop in blood sugar. The heavier the consumption, the bigger the drop and the lower the patient’s blood sugar becomes. This type of symptom can be seen in patients who drink heavily and on a regular basis. It can lead to similar syndromes like alcohol and dry eyes. When a patient drinks heavily and suffers this drop in blood sugar, it can lead to feelings of faintness as well as spasms. Alcohol may also cause the dehydration and avitaminosis, which are likely to result in more severe disorders like Wernicke-Korsakoff disease. There are also several known cases where a patient already has some form of pre-existing allergy. Depending on the severity of those pre-existing allergies the reaction could be pretty extreme. In some of the worst cases of severe allergies to spirits, the resulting symptoms have been seizures. When it comes to the risks surrounding seizures and alcohol, one of the main ones to consider is a genetic risk or family history of epilepsy or other convulsive disorders. The fact is that alcohol and epilepsy can have some pretty negative reactions. One of these negative reactions is the possible raised risk of seizures. Another way that ethanol use can lead to seizures is through the eventual effects of a person suffering from FASD. FASD which is otherwise known as Fetal alcohol spectrum disorder is a wide-ranging term that is used to refer to the various effects of drinking on a person who was prenatally exposed to it. Those who are exposed to it during pregnancy can go on to suffer from a wide range of difficulties from physical to mental and emotional. Amongst these lifelong implications is an increased risk of alcohol-induced seizures. One of the most commonly asked questions on this topic is ‘why does alcohol withdrawal cause seizures?’ The answer to this question is that when a person drinks heavily, their body and brain, in particular, become used to a certain level of chemical activity. The sudden lack of alcohol in their system will undoubtedly cause a chemical imbalance which leads in most cases to convulsions. In cases where there is an increased risk of an alcohol withdrawal seizure, it has proven helpful for patients to look into alcohol addiction therapy. Gently lower the person to the floor. Turn the person onto their side as this will allow them to breathe easier. Remove any sharp objects or dangers from around the person. Find a jumper or something soft that you can lay under their head. Remove any hat or reading glasses that they might be wearing. Loosen their tie if they are wearing one as that could obstruct breathing. If the seizure lasts over 5 minutes, then call the emergency services. In smaller amounts, the average sufferer does not need to worry about their epilepsy and alcohol. If however there is a known family history of this type of disorder or that person is already taking prescribed medication then there may be much more of a risk than normal. This can especially be the case for heavy drinkers. For the safe amount of ethanol in cases such as this be sure to consult a doctor. Getting help with problems involving withdrawal or alcoholism and seizures could be as simple as inquiring about an alcohol treatment facility.